Will fall garden mums come back next spring? 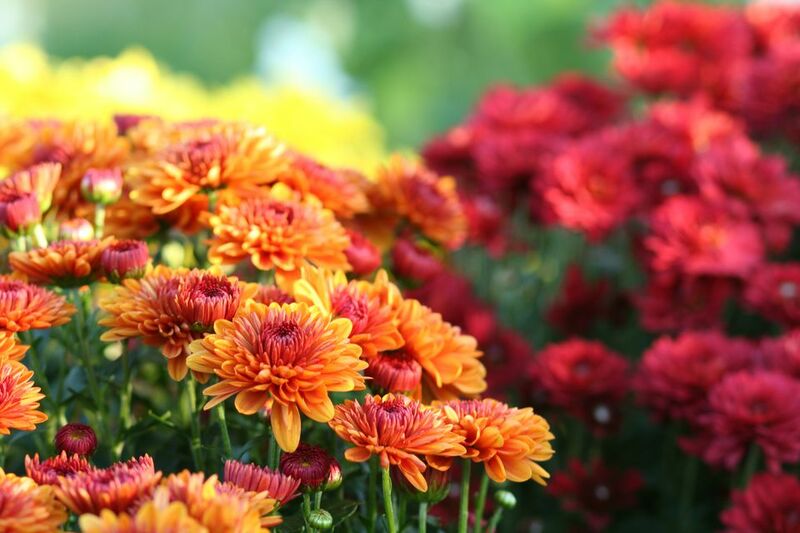 Chrysanthemum plants are a symbol of fall, with their domes of rich, jewel-tone colors. To tempt gardeners to purchase these late season bloomers, they are often sold in full bloom. While it is nice to have instant color and even nicer to know exactly what color you are getting, buying flowers in full bloom can mean they are past peak and already declining. That is fine if all you want is a seasonal decoration, but not good if you are hoping for a hardy perennial plant. You can always grow mums as annuals. They do provide wonderful fall color and work great at filling in empty spots where summer bloomers have faded. Look for plants with lots of unopened buds to have blooms well into the fall season. For mums to be truly hardy, they need time to become established in the ground. Ideally, they are best planted in the spring and allowed to grow in place all season. Unfortunately, the mums for sale in garden centers in the fall have been coddled in nurseries and coaxed to set buds for September blooms. That means they are putting an awful lot of energy into blooming, not growing roots. Planting these specimens in the garden in late summer or early fall does not guarantee sufficient time for the plants to become established. This is not a problem in warmer climates, where a bit of deadheading will satisfy most mums after bloom, but in areas with sub-zero winters, perennial plants need substantial roots to anchor them into the ground. The repeated freezing and thawing of the soil will heave the plant out of the ground and kill the roots. Spring-planted mums will have plenty of time for root growth. Many gardeners are surprised that their garden mums start to bloom in mid to late summer. If you want fall flowers on your mums, you will need to pinch the plants back periodically throughout the summer. Start when the plants are about 4 to 5 inches tall and repeat every 2 to 3 weeks until about mid-July. This will cause the plant to get stocky and bushier, and by late summer, it should be covered with flower buds. Although mums can handle partial shade, you will get the fullest plants and the best blooms in full sun. Chrysanthemum flowers are "photoperiodic" which means they bloom in response to the shorter days and longer nights experienced (in the Northern Hemisphere) in fall. Therefore, do not plant chrysanthemum flowers near street lights or night lights; the artificial lighting may wreak havoc with their cycle. All mums prefer rich, well-drained soil, with lots of organic matter or compost worked in. They like a soil pH slightly on the acidic side. Mums prefer evenly moist soil. Water the plant when the top 1 inch of soil begins to dry. If watering in a pot, water the soil surface using a watering can until moisture begins to drain from the bottom of the pot. Checking your pots for drainage holes before committing to using them. Water should drain freely through the soil and out the bottom of the pot when watering. Soil should remain moist, but not soggy. Soggy soil can cause root rot and other diseases. As one of their nicknames "hardy mums" suggests, they can handle cool temperatures. Mums can overwinter in the ground, and they do so even better in the warmer climates. For fall planted mums to have a better chance of survival in cold areas, you need to give the roots and crown of the plant extra protection. First, leave the foliage on the plants until spring. Do not prune them back after frost has turned them brown. Then, either mulch the plants heavily with at least 4 to 6 inches of mulch or dig up a pot, and move the plants to a more protected spot in the garden for the winter. If you choose to move the plants, do so before the first hard freeze. In warmer climates, consider heat delay. If you have high temperatures, particularly at nighttime, it can cause the plant to flower later than it normally would. Heat delay can cause irregularly formed flower buds, erratic flowering, deformation of the plant’s crown and other developmental issues. To bypass this problem in hotter climates, look for cultivars with higher heat tolerance. It is important to provide nitrogen and potassium to chrysanthemums during their vegetative phase. Feed the plants before flower buds form to promote healthy roots, bud development, and a vigorous plant. Start a feeding cycle in March, April, or May, depending upon your zone. You can get a time-released fertilizer (12-6-6), which feeds the plants for about three months. With this fertilizer, you might only need to feed the plants once. The general rule of thumb is to begin after all danger of frost has passed. That way any new growth forced by the nutrients will not be in danger of damage from icy weather. Established plants should not be fed after July, so new growth is not injured by frost. Repotting is the single most important thing you can do to increase the longevity of your mums. Most mums are completely root bound when you get them. The roots have taken up the entire pot, which makes it really hard for the soil to retain any water. To repot, choose a container that is a little bigger than the last container. Fill the bottom of the new pot with a good quality potting soil. Break up any roots you can, but do not damage the roots. When you put the plant in the new pot, the surface of the soil should be an inch below the lip of the new pot. Make sure you have soil, not air surrounding the roots. Tamp down soil gently. Give the pot a good watering until it flows out of the bottom of the pot. You can propagate mums several ways: division, seeds, and cuttings. Your easiest and fastest method will be through division. Division: Divide plants that have grown in the garden for at least two years. Younger plants will not have a sufficient root system to survive. By every third spring, divide chrysanthemums to rejuvenate them. Do this in the spring. Pick plants that are at least 6 inches tall. Be careful to not damage the roots. Replant at least 18 inches apart. Seeds: Mums can grow from seeds, but it is best if you use purchased seeds. If you attempt to plant seeds from your own plants (most are hybrids), the resulting plant may not be true to the parent. If you are OK with a mystery result, then go for it. Start seed indoors, 6 to 8 weeks before your last frost date and harden off plants before transplanting outdoors. Cuttings: This is a good method to get a replica of the plant you have. It does away with the mystery that comes with seeds. Although, this method does have extra steps. You have to cut a stem that is at least 4 inches, dip the cut end into a rooting hormone, plant it in a container, wait about 4 weeks or so for a root to grow and for the plant to grow another 2 inches, then transplant it outside.